There has recently been a surge in demand for Afghan carpets, although many Afghan carpet manufacturers market their products under the name of a different country. The carpets are made in Afghanistan, as well as by Afghan refugees who reside in Pakistan and Iran. Famous Afghan rugs include the Shindand or Adraskan (named after local Afghan villages), woven in the Herat area, in western Afghanistan. Afghan carpets are also quite commonly known as Afghan rugs - are a distinguished and well recognized handmade material design that originates from Afghanistan. They intricate detailing mainly using designs from traditional tribal designs including Turkmen, Kazakh, Baloch, and Uzbeks. 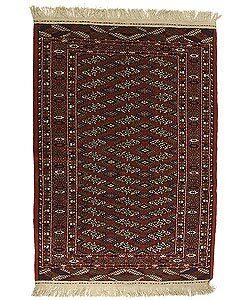 The hand-made rugs come in many patterns and colors, but the traditional and most common example of an Afghan carpet is the octagon-shaped elephant-foot (Bukhara) - The rugs with this print are commonly red in color. Many dyes such as vegetable dyes are used to give the rich colors.